Exercise, animals & positive people are all recommended to relieve stress, anxiety and depression. We'll have them all! The perfect cure for a chaotic week. Enjoy a yoga class while the over friendly (and oh so cute!) pygmy goats run around, under, and over you! Goat Yoga is therapeutic, relaxing, and sure to make you smile, with the assistance of smart, social, and extremely cuddly animals. It may not be the cure for all that ails you…but it IS an unbelievable distraction from work, stress, illness, anxiety, or depression. 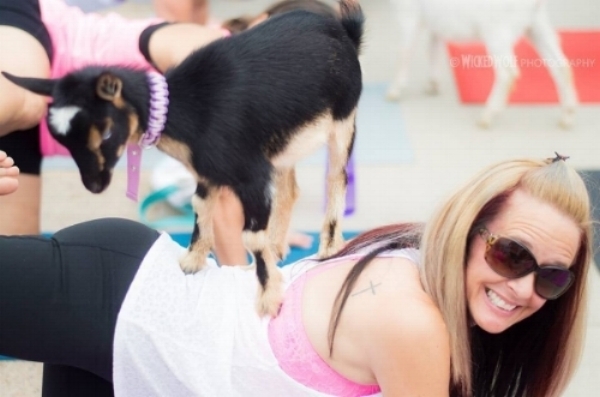 These Happy Goat Yoga classes serve as a fundraiser for our 501c3 non-profit. Proceeds from these great classes help us to carry on our mission. Thank-you for your support and kindness. Select the link below to locate and sign up for a session near you! All of our events are created and managed by It’s For Charity! Events! They host good mood boosting experiences throughout DFW that help support a local charity and business. Check out their website by clicking their name above.